Pingdom Tools is a free set of web-based tools for webmasters and other web-curious people. We launched it this summer and it has proven extremely popular. So far, more than two million tests have been performed with its graphical website load time, ping and traceroute tests. We have just added a major improvement to this tool: The ability to save tests, which can then be accessed by anybody through a direct link. Because you can see exactly how a site was behaving at a specific point in time. It becomes extremely easy to share the results of a test so others can examine it. 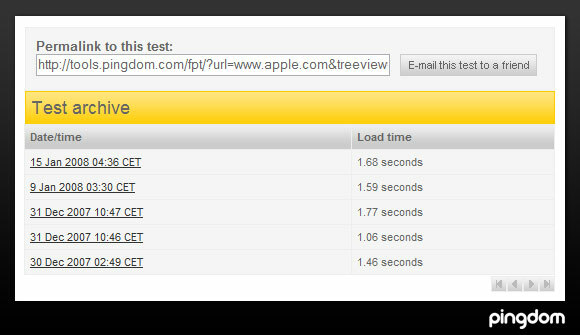 Since the AJAX-based graphical interface of Pingdom Tools makes it easy to pinpoint why a site is slow (or down, for that matter), a lot of people post screenshots of tests in forums and blogs. Web hosts can also use Pingdom Tools when communicating with their users, or vice versa. We wanted to give even more power to those users. With the new save and link features sharing this information will be easier than ever. Just save your test and you will have a permanent link you can send to anyone as proof. They will be able to see exactly the result you got and when the test was performed. A saved test is much better than just a screenshot, because you can properly examine, sort and filter the saved result. And if a site is down, you have the Ping and Traceroute tools to help you find potential connectivity problems. You will now be able to see a list of all previous (saved) tests of a website when you perform a test in Pingdom Tools. In March, you will be able to go back and look at tests that you or anyone else performed in January. If a website is tested regularly, you will have a really handy list of historical tests to look at. This gives you lots of opportunities to compare “before-and-after” results, to name just one possibility. With this feature Pingdom Tools has become a lot more powerful, and the more people use it, the more powerful it will become. We are very happy about all the positive feedback we have received about Pingdom Tools and that so many people are using it. We hope that these new additions will help people share test results among themselves to an even greater degree and that Pingdom Tools will keep acting as a great resource to the webmaster and web developer community (and everyone else as well!). Note: Currently all Pingdom Tools tests are performed from Dallas, TX, USA. More locations will be added in the future. Read more about how to use Pingdom Tools to analyze websites. I tried out Pingdom Tools on my web site http://www.dancingbison.com and some pages under it – it looks like quite a cool and useful tool – thanks!